Why Cats Sleep So Much | All Things Woof Meow, Too Inc. The truth is that cats sleep about twice as much as humans. A cats sleeping pattern can vary depending on the cat’s age, size, and temperament. On average, a cat will sleep 13-16 hours per day. Think about it, a cat will sleep for about 2/3s of its lifetime. That’s a lot of sleep for such a small animal. One reason cats sleep so much is because they are crepuscular animals meaning they are active during dawn and dusk. Sleeping is part of their natural instincts because of their predatory nature. As predators they need sleep because they expend lots of energy while hunting. A cat needs energy for hunting, stalking, pouncing, and wrestling its prey into submission. The need for sleep is therefore in direct proportion to the amount of energy required to hunt. The only way your cat can meet its own energy needs is to take frequent catnaps throughout the day. Another reason why your cat sleeps so much is because of its age. Your cat’s age greatly affects his activity level. For example, a kitten will tend to sleep more than an adult cat because they need the energy to grow. Like a newborn baby, a new born kitten will sleep most of the day away and just like an old man, a older cat will slow down and sleep more than its younger counterparts. If your cat also develops conditions such as arthritis and other joint issues as it gets older, it will also tend to sleep for longer periods of time. If your cat happens to suffer from a sickness or obesity, this can also slow your cat down and cause it to sleep more. 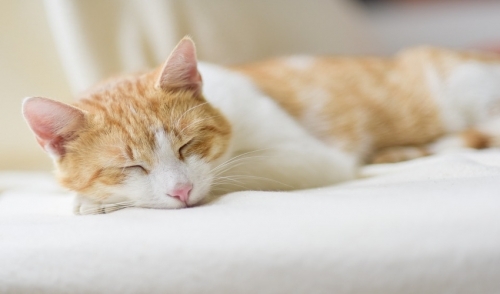 If he seems to be sleeping more than usual or appears sluggish when awake, take your cat to the vet for a checkup. Cats can suffer from many illnesses such as anemia and hypothyroidism, which can increase the amount sleep your cat gets per day. Also, an overweight feline does not have the same amount of energy as one that is at the correct weight. Extra pounds can slow your cat down significantly making it more lethargic when awake. To combat cat obesity, speak to your veterinarian about putting the cat on a diet cat food to help increase its energy level and lose weight. Even though cats sleep most of the day, they do not sleep in marathons like people. Cats nap multiple times a day, and because of their predator instinct they wake up frequently to check their surroundings and make sure everything is OK. A cat’s sleep doesn’t last for a long period of time, but it happens often enough so that it has the necessary energy to hunt and play with its owner when it’s awake. That explains why they call it a catnap.